And this mouth-watering chicken recipe proves it! Want an Italian-style grilled chicken recipe with evenly cooked, juicy meat, crackly skin, and bold Mediterranean flavor? Then here’s the recipe for you! We have made it a few times now and each time we marvel over how flavorful and succulent the chicken turns out. The key? Removing the backbone of course! The instructions call for two standard-sized bricks for this recipe. Placing the bricks on the chicken while it cooks ensures that the skin will be evenly browned and well-rendered—don’t skip this step. 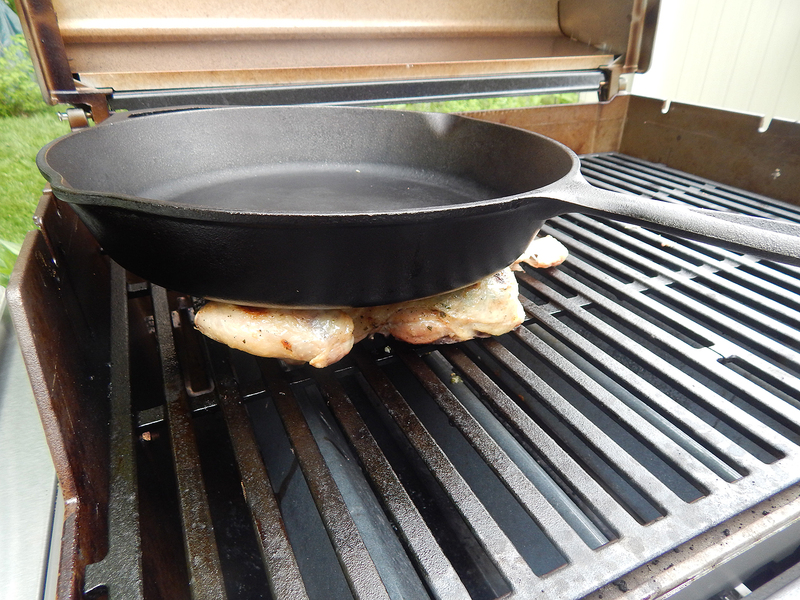 Lacking bricks, we used a large cast-iron skillet. For the best flavor, use a high-quality chicken, such as Bell & Evans. In Step 2, the directions call for refrigerating the prepared bird for 1-2 hours. This last time, we refrigerated it for seven hours because we were gone most of the day — and from now on, that’s what we’ll do because the extra time made the chicken skin even crispier. Combine oil, garlic, lemon zest, and pepper flakes in small saucepan. Bring to simmer, stirring frequently, over medium-low heat, about 3 minutes. Once simmering, add 3 teaspoons thyme and 2 teaspoons rosemary and cook 30 seconds longer. Strain mixture through fine-mesh strainer set over small bowl, pushing on solids to extract oil. Transfer solids to small bowl and cool; set oil and solids aside. 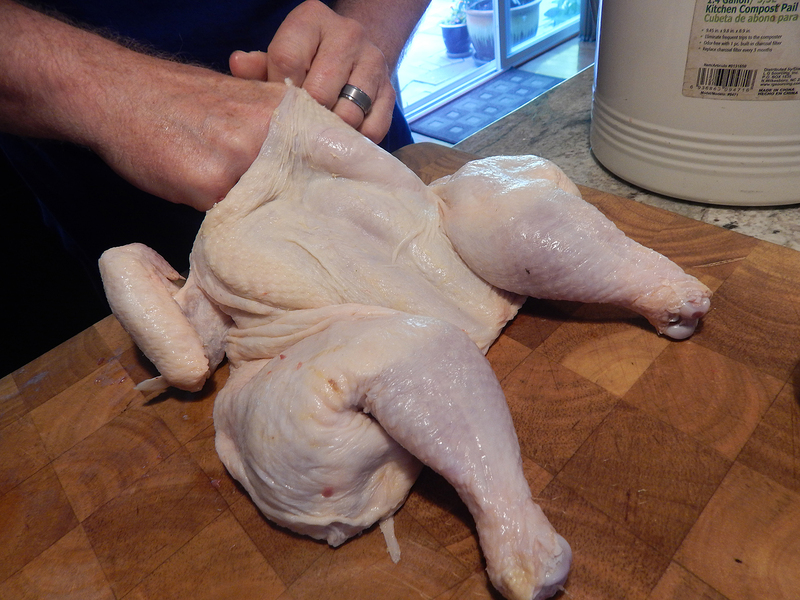 Following step-by-step instructions below, butterfly chicken, flatten breastbone, and tuck wings behind back. Using hands or handle of wooden spoon, loosen skin over breast and thighs and remove any excess fat. Combine 1 tablespoon salt and 1 teaspoon pepper in small bowl. Mix 3 teaspoons salt mixture with cooled garlic solids. Spread salt-garlic mixture evenly under skin over chicken breast and thighs. Sprinkle remaining teaspoon salt mixture on exposed meat of bone side. Place chicken skin-side up on wire rack set in rimmed baking sheet and refrigerate 1 to 2 hours. Turn all burners to high. Wrap 2 bricks tightly in aluminum foil and place bricks on cooking grate. Heat with lid down until very hot, about 15 minutes. Scrape cooking grate clean. Leave primary burner on high and turn off other burner(s). Place chicken skin-side down over cooler side of grill with legs facing fire, place hot bricks lengthwise over each breast half, cover grill, and cook until skin is lightly browned and faint grill marks appear, 22 to 25 minutes. Remove bricks from chicken. 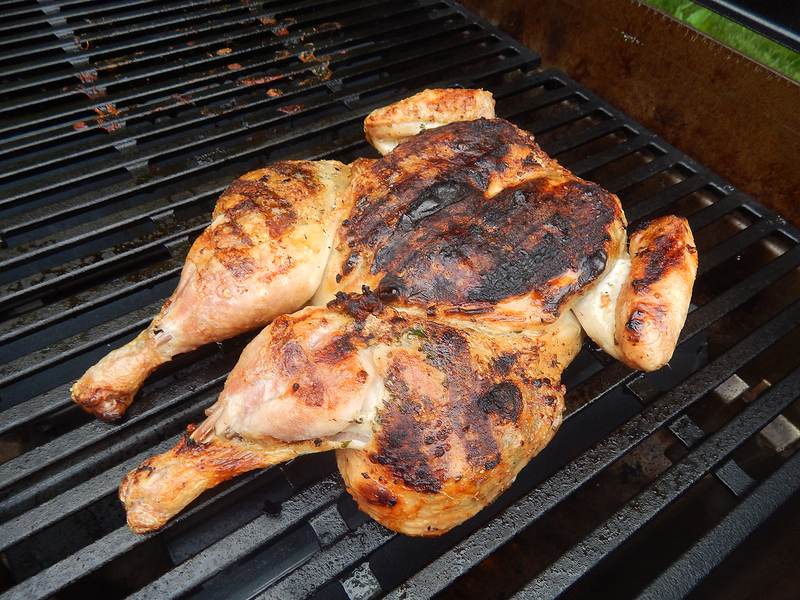 Using tongs or towel, grip legs and flip chicken (chicken should release freely from grill; use thin metal spatula to loosen if stuck), skin-side up, with breast facing the cool part of the grill. Place bricks over breast, cover grill, and cook until chicken is well browned, 12 to 15 minutes. Remove bricks, flip chicken skin-side down over hot grates, and cook until chicken skin is well crisped and instant-read thermometer inserted into thickest part of thigh registers 165 degrees, 5 to 10 minutes, moving chicken as necessary to prevent flare-ups. 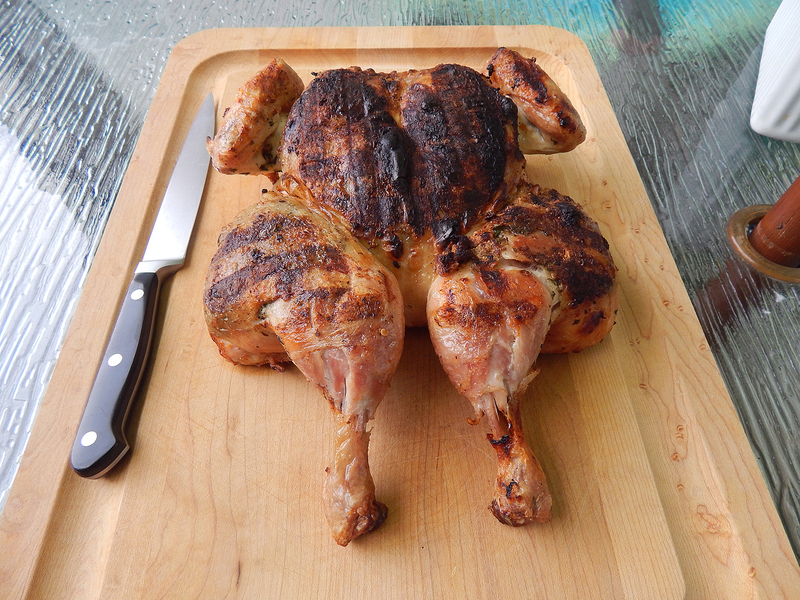 Transfer chicken to cutting board and let rest 10 minutes. Whisk lemon juice and remaining thyme and rosemary into reserved oil; season with salt and pepper. Carve chicken and serve, passing sauce separately. 1. BUTTERFLY Cut through bones on either side of backbone, then discard backbone. 2. PRESS Flip chicken over, then flatten breastbone and tuck wings behind back. 3. SEPARATE Loosen skin over breast and thighs and remove any excess fat. 4. SALT Spread salt-garlic mixture under skin of breast and thighs. Spread salt mixture on meat of bone side. Published in the May 2009 issue of Cook’s Illustrated.